Earlier today, we told you that the BlackBerry Motion, TCL's latest handset branded with the BlackBerry logo, will launch on January 12th via Amazon and Best Buy. This is the GSM model of the phone which means that it will only work in the states on AT&T and T-Mobile. If that is okay with you, Amazon is now allowing consumers to reserve the Motion by pre-ordering it from the online retailer's website. There are some nice features on the Motion that no BlackBerry has ever had before, including an IP67 certification rating. This means that the handset can be submerged in water as deep as 3.3 feet for as long as 30-minutes, and emerge unscathed. Try that on your BlackBerry Storm 9530! The 5.5-inch display sports new anti-scratch protection (although many of you might prefer anti-itch), and the phone is powered by the largest capacity cell to ever set foot inside a BlackBerry phone, 4000mAh. Combined with the energy sipping Snapdragon 625 chipset, battery life is tremendous. 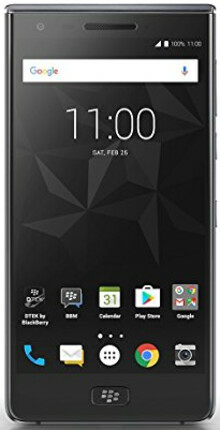 You can pre-order the BlackBerry Motion from Amazon by clicking on the sourcelink. The price of the handset is $449.99, and shipping is on the house. If you're into physical keyboards, you might want to see what BlackBerry has up its sleeve later this year. The company has said at CES to expect two new models to launch this year equipped with a physical keyboard. That comes after the company had one of the sleeper hits of 2017 with the BlackBerry KEYone. Pre-ordered as soon as I read this. After my pleasant experience with the KEYone, I am eager to get my hands on this. BlackBerry's Android experience is stellar. A solid handset that no doubt offers a BlackBerry Android experience on par with the KEYone. I just prefer the physical keyboard on the KEYone to the all touch slab that is the BlackBerry Motion. I forgot this device was also IP67 certified. Just one more plus going for it. Although I still feel its a little overpriced I wish TCL and BB well. Definitely a plus for smartphones in this day and age. I agree, that price for the offered specs is ridiculous. This looks more like a budget phone with a shiny coat of paint. Hopefully BlackBerry and TCL have something better in the future. Love the BlackBerry Android experience. It’s near stock Android, so if that is your thing, I recommend a BlackBerry Android handset. BlackBerry takes good care of its software, almost always adding new features to their handsets with each monthly security patch. Love their apps, as well. Battery life is amazing on the KEYᵒⁿᵉ, and on the Motion. Battery life is the number one draw for me concerning a Smartphone. I prefer a physical keyboard, but BlackBerry’s virtual keyboard is among the best in the business. Camera in the KEYᵒⁿᵉ is great! Not Samsung/Pixel levels, but using the same camera sensor as the Pixel 1 is a blessing for the KEYᵒⁿᵉ and Motion. UI is smooth overall. Not the fastest out of the gate, but definitely a consistently smooth experience. Anytime, my friend. Glad I could help out.